Best mates since they met on their first day at uni, Anthony Bennett and James Carroll both dreamed of working with animals from the time they were young. Committed and passionate about caring for creatures great and small, they share a mischievous sense of humour and a wonder for life that charms both animals and owners alike. 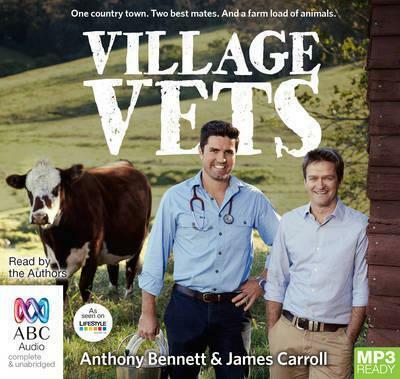 Warm, funny and fascinating, Village Vets chronicles the lives of these two young Aussie vets before they were famous - their adventures here in Australia and overseas will delight readers of all ages. There are stories of crazy cats, cranky cows, rude cockatoos, unexpected outcomes and miraculous recoveries. They have worked with every animal imaginable - operating on guinea pigs and euthanasing a pet fish, treating a horse that had lost its foot and fixing a prolapsed cow with a piece of polypipe. As much about the people they meet as about the animals, Village Vets is an unforgettable insight into the heartache and joy of life as a country vet.